Your local public television station needs help during the Action Auction. During the Action Auction we need individuals who would be willing to place phone calls to the winning bidders and enter their information into our database. This opportunity is great for team building with your staff while helping CET raise critical funds to continue their quality programming. 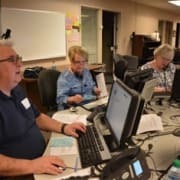 There are various shifts available for volunteers that begin as early as 5:30pm during the week and 2:30pm on Saturday. We provide dinner, from a local pizzeria as well as ice cream from a local ice cream chain. This task requires data entry skill as well and a willingness to place phone calls to the winning bidders. Come be a par to of the Action!